Please Note: Our 2 Day Cairns Tour Package with Ocean Spirit Cruise does not include bus pick up, just walk to the Reef Fleet Terminal to check in. For the Kuranda Day Tour this includes FREE bus pick up and drop off from a Cairns Hotel only. The Northern Beaches are Extra Cost. Please Note: Child Age is 4-14 Years Old. 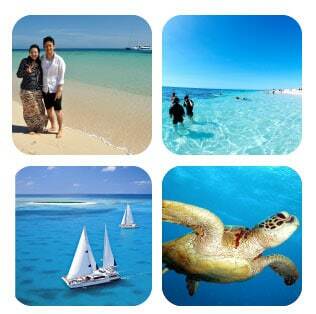 Visit The Great Barrier Reef with Ocean Spirit Cruises, a full day on beautiful Michaelmas Cay. Relax, Snorkel in the shallow waters of the Great Barrier Reef. On the second day enjoy a full day tour to Kuranda. Enjoy the 1.5hour scenic train ride and Skyrail rainforest Gondola. Walk to The Reef Fleet Terminal only about 10 minutes walk from most hotels in Cairns. Ocean Spirit Cruises is one of the longest running sailing catamarans to the beautiful Michaelmas Cay, a beautiful white sand cay located in the middle of The Great Barrier Reef. Walk in off the beach and snorkel the beautiful corals in nice shallow water. Giant clams, Hundreds of Reef Fish, Parrot Fish and crystal clear blue water. Great for the whole family or couples wanting to relax on this beautiful sand cay and snorkel from the beach. With crystal clear blue water and amazing coral reefs straight of the sand cay, visit Michaelmas Cay with Ocean Spirit Cruises. You Can now choose Train Up and Skyrail Down or Skyrail Up and Train Down. Just let us know on the booking form what you would like to do. 3 - Hours FREE time in Kuranda Village. A fantastic scenic day for the family with small children or couples looking for a great way to see the Rainforest from the Scenic Railway and Cable Car.